Grow your email list and Instagram, Pinterest, Facebook and YouTube followers with our WordPress plugin pop-up! Welcome to episode 53 of The Blogger Genius Podcast. Today I’m interviewing Tori Tait from ToriTait.com. 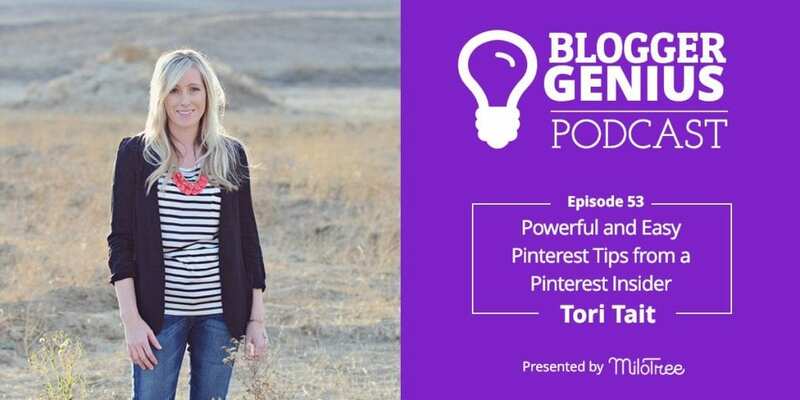 If you want powerful and easy Pinterest tips from a Pinterest insider, Tori is your woman! Tori works for Pinterest, designing images for brands. So she knows how the platform really works. You don’t want to miss her tips for creating images that stand out, how to think about keywords, communities, hashtags, and more! If you use Pinterest to drive traffic to your site, you will LOVE this episode! Welcome to The Blogger Genius Podcast brought to you by MiloTree. Here’s your host, Jillian Leslie. Hello and welcome back to The Blogger Genius Podcast. If you are a Pinterest enthusiast, if you want to take your Pinterest to a whole new level, you are going to love this episode. Today, I am talking with Tori Tait. Tori is an old-school blogger like me. We’ve known each other for years, and wait until you hear kind of how we bonded years ago over Padma Lakshmi, host of Top Chef. Anyway, Tori is old-time blogger but also, she’s a Pinterest Insider. So what she does, she’s hired by Pinterest to work with brands to create pins and campaigns for big brands, so she knows her stuff. What I love about her is she cuts through the noise. She’s no BS. You want actionable high-level Pinterest strategy? She is your woman. So without further ado, here is Tori Tait. Tori, welcome to the show. Thanks for having me, Jillian. So we were just talking about how, first, like I’ve known you online forever, probably from when you started and when I started. And we just have this funny story which is we both were working with a… I think it was a wine brand, right? And they, at the end of the culmination of this thing, they were flying us to New York and I couldn’t go because I got sick. But the cool part was that we were supposed to go hang out with Padma Lakshmi from Top Chef. And I was bummed that I didn’t get to go but then I got to interview her on the phone for my blog post, and I found that she didn’t get me at all and that she was very serious when I tried to crack jokes. And then I took it very personally. And then you told me that when you met her in person, she was also very serious. Indeed, she was quite intimidating. You know, just because she’s beautiful and very tall and very famous, and well-known but also then she didn’t come through as very friendly. She took her job as she should, I suppose, very seriously critiquing these bloggers who are competing in this party and food challenge very seriously. So anyway, so I remember bonding with you and we were trying to figure it out, so you think it was at the BASH Conference where we actually got to meet in person? Yeah, I think we did get to meet. We both attended I think it was the first BASH Conference and we finally got FaceTime after all of these years. Yes. And we were sitting next to each other bonding over Padma. Which is really cool. Okay, so I’ve been following your whole career and I know that you’ve done a variety of things. So will you share kind of how you got into this whole online space and your blogging and your marketing and all of that stuff? Definitely, I’d be happy to. So it’s quite the windy road but every step along the way has really, I think, been very important to sort of how my career’s unfolded. So in 2006 I was a recent college grad, I had a Communications degree and no clue what I wanted to do with it. I picked up a parenting magazine of all things and I had read this article about these women who had started this online forum called Mompreneurs Online for other women who wanted to do businesses online or, you know, entrepreneurial endeavors and I just logged on. So this is, you know, a chat forum way before there was Twitter or Facebook groups or anything like that. and I just started getting so inspired. It was a small group of women in this forum from all different walks of life across the country. There were lawyers, product designers, shipping consultants, bakers, just the gamut. And I decided I was going to start an online personalized stationery company. So this is before Etsy. This is before you could do and easily create a Shopify site. I didn’t know how to sell it online. So I taught myself how to code and I began a website selling personalized stationary goods. During this time, I made these really great relationships with the women in this forum, and about a year in, I realized I didn’t like manufacturing products or shipping or any of that. I love the marketing aspect. And Twitter had just came onto the scene, Facebook Pages were just sort of being rolled out and I realized I had become the go-to source for all of the other women entrepreneurs in this group for all things social media and branding online. So I closed my stationary shop and began what has now been a 10-year career in social media and content marketing. At first, I worked sort of freelance with all of these smaller businesses as clients. And then about 2009, I joined a startup out of Boston called The Grommet. The Grommet sells unique products and gifts online. I joined and worked there for nine years as a director of content and community. Then just recently, I’ve joined a new company called 2Modern. And I do the same thing; I’m the director of content and community, we sell luxury furniture online. So sort of the one windy part of this journey is that entrepreneurial road that led to this marketing career. But interestingly enough, in parallel to all of that, at the same time, in 2008 I started one of the first entertaining blogs online. So I had this passion and love for entertaining in my home and throwing parties and there wasn’t really much out there besides like the intimidating Martha Stewart of this space. And so, I started a blog called Thoughtfully Simple and began creating content and sharing my work around cocktails and food and entertaining. So really, for the past 10 years, I’ve had one foot in the marketing brand world and one foot in the blogger world, which has really given me I’d say a unique skill set and perspective really, that one has fueled the other. So my work in marketing has really fueled my success as a blogger and my work as a blogger has really allowed me to be a better marketer for brands. And one interesting thing that happened last year was that Pinterest hired me on as a contract graphic designer. So in both of my worlds as a blogger and as a brand, a lot of my work has gone into Pinterest, you know, how a brand will use it in success there, using it as a blogger working with, you know, sponsored posts and things like that. So this skill set has developed of really understanding what works on Pinterest, and at the same time, Pinterest as a company sort of outgrowing their capacity to help big brands create pins. So when you have a big brand like a Disney or, you know, name the brand, a Walmart who wants to create pins and wants maybe to test on Pinterest ads, Pinterest can then tap me to actually create them. So it’s a really windy confusing road, but all of these things really work together. And I do all of these three things every day. Oh, my God. Okay, so the way that again, you know, we are behind Catch My Party and I’ve always known about Thoughtfully Simple and you always make the most beautiful cocktails. I get your email, I’m on your email list. So if anybody out there is looking for cocktail recipes, definitely check out your blog which is, again, and then I knew about all these other pieces but it’s interesting to see how you put them all together or how you’ve been open to new opportunities leveraging off of your skill set. Yes, definitely. I never am going to predict what’s around the corner. I just sort of keep doing things I love, refining my skills, sharing what I know along the way and looking for new opportunities. It keeps it really exciting. And that’s the beauty about working online in any capacity is you know things are going to change and there’s going to be new opportunities tomorrow that you couldn’t even have imagined. Absolutely. Like, when we started, would we have even known that there was something on the horizon called Pinterest and it would know our businesses like completely and give you a new job? Not at all. So I love that attitude because I think that there are two ways to see it. One is, “Oh, my God, things are changing,” and it’s too intimidating and I wish it would go back to the way it was. And then the other attitude is, “Oh, I’m open, I’m holding on for the ride. I don’t know where it’s going to take me but I’m here,” and I’m going to learn and I’m going to show up. Because really just a simple mind shift of like, “Oh, this is exciting. Let me learn something new,” it just makes the work all that more exciting. So I take it you’ve always been creative and artistic. I have, yes. I am definitely more the creative side than the analytical side. But as a marketer I’ve, over the years, definitely had to build up that analytical muscle. It is important, too, but I am definitely more creative. Okay. And were you a graphic designer at any point? I know you’re a Communications major. No. I say I am not a graphic designer, I just play with it on the internet. I’m just self-taught. That’s it. And how did you teach your self? Because, again you do have to weirdly become a graphic designer to be on the internet. Now, you can fake it, like I do, like using Canva templates and things, but like, how did you learn how to do this? I Google stuff. Let me just not have a better answer than that. You know, it’s a lot of practice, rinse and repeat. Practice, practice, practice and when I can’t figure something out. That’s the beauty of the internet. There are YouTube videos to teach you how to do anything and everything. And look, I had no formal training in Photoshop but I made it, you know, a commitment and sort of a passion to refine my skills. And now, I work for Pinterest as a graphic designer designing for big, big brands, you know, and so it’s doable. I don’t know if you’re familiar with Marie Forleo, but my favorite quote is, she says “Everything is figureoutable” and that has definitely always been my motto from figuring out how to code a website to how to create great graphics and Photoshop that looks really intimidating. All of it, we can figure it out in groups and together Googling. There’s always a way. That is the beauty of people who are willing to share their experiences and those of us who are willing to seek out answers and ask for help because it’s all there, right? Absolutely, absolutely. And it’s funny because you, I believe, probably do have this really interesting perspective about for marketing because you are also a blogger, so you see it from a variety of different angles. Yes, I think it’s definitely helped me on both sides. You know, one being a blogger and, you know, in blogging communities and at conferences and with friends, I’m able to say, “hey,” these things brands are doing, bloggers can easily do too. So it’s kind of like here’s this inside knowledge, right, from this, you know, what might be sort of unknown marketing world, what are the brands doing. You know, they are just people sitting around and Disney, just like us, thinking about what they’re going to post to Twitter and what’s working on Pinterest. So I have sort of this access, you know, to sort of this thinking and understanding that I can bring it to bloggers and this is a very approachable way to do things that you can do to. And as a blogger, we’ve got all those scrappy skills, right, and all that the feet on the ground kind of information that I can take back to those marketing conversations and kind of get ahead of the game. Because oftentimes in marketing roles or larger companies, there’s a lot of red tape and processes and I’ve always just been able to bring sort of that scrappy “let’s just try and do it” mentality that bloggers seem to have. So yeah, definitely I love having one foot in both worlds. Yes. And for us, for example, like we built MiloTree for Catch My Party because we’re bloggers and we have a site and then it worked. And then we’re like, “Oh, we could roll this out to help other bloggers like you, you know, grow their following,” but we’re also boots on the ground. So we’re not some big company who, you know, has this SaaS product and whatever. No, no, no. Like we we straddle both worlds so that we understand the world of food bloggers or parenting blog, whatever, like we get it because we’re there. And so, it has helped inform us to go deeper because we understand the pain points, because we live those pain points. So can we talk about Pinterest? And some of these insights that you have because you get to work with… like the main advantage I would say for brands is they have more money, so they can throw more money around but you’re right, which is because they can throw more money around, they don’t have to be as crappy. Oh, I like that. Can you explain that? Yeah. So, you know, marketers think a lot more strategically about certain things. Take Pinterest, for example. They’re thinking holistically about not only what their creative looks like — and that in itself is one of my favorite topics and we could talk forever about that. But, you know, a lot of thought and planning goes into what they’re designing, what their description is and keywords, where that pin is going to land people, what the landing page looks like, what people are going to do once they get to that landing page. You know, are they trying to capture sales, emails, you know, are they re-targeting people. So there’s a lot of thought that goes into it. But then that also oftentimes means for bloggers or for marketers, pardon me, it’s a slower, longer process. You can spend months doing that. So when I say think like a marketer, I say yes, think strategically and the whole picture of your Pinterest marketing efforts, but act like a blogger. Do it fast, do it quickly. Be nimble. Test things change. Because that’s what’s going to get you ahead of your competition. And the truth is that on Pinterest, you know, a food blogger who is, you know, two years in, their competition is Kraft. It is all of those big brands because we’re all sharing the same type of content on Pinterest, going after the same eyeballs. Kraft can put out a recipe for, you know, an appetizer. A food blogger can make a very similar appetizer. You’re competing for the same people. So you can think strategically but move quickly, and test and iterate, and just keep plugging away, then they’re going to have the advantage. Whereas, sure Kraft might have the money and it might take them two months to plan, you know, some content they’re going to create, show design, you know, get approval. But if you are there first quicker, their money is not going to count, it’s not going to count as much in capturing those eyeballs because you already have had that content there. I love that. Okay, so down and dirty tips. When you were just talking about that whole… I would call it kind of like a whole journey, right, from like to map this out. So let’s start with… I love this, I always do this. Let’s start with you’re a food blogger. And so initially, your job is you want traffic. So walk me through and then we’ll go like food blogger who’s selling a cookbook or something like that, but like, walk me through how you would unpack that and we can, you know, do a variety of examples. But let’s say I just want traffic. What do you recommend I do in terms of my pins and where they land and keywords and things like that. Yeah. I mean, there’s so much that goes, you know. At face value, Pinterest seems pretty simple. Create a graphic, pin it. But there’s so much that goes into it and we’re talking about the strategy. But I’ll start with the easiest win out there. The one you just might be like either overwhelmed because they’re just starting or like kind of at a plateau. The easiest win is improving your creative. So the truth of the matter is, like, you’ve got to capture someone’s eyeballs and you want to stop there scroll, right? If someone is on Pinterest looking for something, a recipe, a cookie recipe and they’re just scrolling like as fast as you can imagine, they’re probably half paying attention. Maybe they’re standing in the grocery store line or laying in bed at night. We don’t do that, right, but yes, we all do that scrolling on our phones. And you’ve got to stop there scroll. What’s going to matter in that moment is your creative. And by the way, for everybody, creative is your image. Yeah, sorry. Like your actual image of your pin. And so I think this is just one of the easiest ways to improve your Pinterest strategy, it’s an easy win. If you’re designing pins the same way everyone else is, your content isn’t going to stand out. If you’re just doing the same thing that everyone else is doing. And I can give you an example and you’re going to immediately know what I’m talking about. Maybe three years ago someone wrote an article that the best way to lay out a pin is like have one image and then a big color block with some text and then an image below. So if you look up chocolate chip cookie recipe on Pinterest, you’re going to see a lot of images that look exactly the same. But if you’re doing the same thing everyone else is doing, you’re not going to stand out. So I like to tell people find your own creative image pin quote recipe. And there are so many ways that you can design a pin. It might not seem like that at face value but there really is when you start thinking about it. You can play with collages versus really large long images you can zoom in on parts of an image that really might pique someone’s interest. You can play with different ways to do that text overlay that isn’t just that typical slop-it-in-the-middle. There are so many ways you can sort of play with it. It’s one of my favorite things because it’s one of the lowest barriers to entry. Everyone can do it, you can do it in Canva. If you’re more advanced and you have Photoshop, there’s not a lot of barriers. In fact, my Pinterest, I have a Pinterest masterclass and 4 of my 12 lessons focused solely on this — creative strategies of designing pins that just stop the scroll. Isn’t it also this concept of we want to interrupt the pattern. So for example, I’m looking in my office right now and everything kind of looks like how it normally looks. So I don’t see it. But if, for example, like every, you know, all of a sudden something moves in the background, I notice because it interrupts what I think of as this is what it’s supposed to look like. So if a bird flies, I don’t know, close to my window. And, you know, I will notice that because boom, there’s something that draws my attention. And I’ve heard this, which is think about when you’re scrolling, you’re almost like in a trance and you’re seeing the same kinds of images and you keep going. But all of a sudden, if let’s say there was an image there that really interrupted the pattern, it would get your attention. Yes, that’s definitely it. And, you know, kind of wanting to squash the notion that you’ve created, say, this recipe, say it’s for a chocolate chip cookie that you can only create one pin to represent that blog post, that is absolutely not what you should do. You should be creating four or five different versions of that pin uploading to Pinterest and linking back to that, linking back to that blog post with the recipe, one, because Pinterest’s algorithm really likes that. They love when there’s different images linking to the same content. So these images don’t all have to be in the blog post? They do not. I mean, they should definitely feel like the same content. So, you know, it should feel like they’re in the right place if you find that image on Pinterest saying click through. But you can rearrange the images, combine them, zoom in on them, zoom out on them and create different versions of pins that point back to this recipe. And one, that’s going to make the Pinterest algorithm, God, so happy. And two, it’s going to allow you to then start to see “Well, which of these images is driving the most traffic?” And that’ll help you sort of develop, you know, what I was calling sort of your Pinterest creative recipe, like your layout, to come up with some different ways that you can, you know, combine images or represent blog posts that aren’t just the same thing every time. You’ll be able to start to see what’s resonating and what’s not based on what’s getting saved and what’s driving traffic. Because ultimately, that’s what you want. Right? Totally. And do you get surprised? For example, you’re working with Disney, let’s say, and you make them four images. And you think, “Oh, this is the one that’s going to do it,” and then it turns out that it’s another one that you didn’t anticipate would be driving a lot of traffic. There are some surprises and I think a lot of it has to do sort of with if you get stuck in that rut, like you were mentioning, you know. I design probably for 3 to 4 big brands a week for Pinterest. And the surprise is, I think more happen on their side when they allow me or when bloggers themselves allow themselves to sort of push the creative boundary and do something different. And then it works. So I love those surprises. I was reading this article once and they were talking about why all SUVs look alike, right? And they all kind of look like I think like the Lexus SUV because Lexus was one of the first companies to come out with that kind of luxury-ish SUV. But again, you want to get out of that rut and not make your SUV look like the same SUV that everybody… even if it’s nice. Yeah, I mean the reward is so great. The risk is so little, especially for bloggers if you’re not, you know, it’s organic content, you’re not paying for ads and why not test a bunch of different things? Because there’s no risk. You can place something that really resonates and stands out and that is different from every other food blogger or, you know, anyone else in your space and it’s sending you traffic, why not? Why not? Or if you feel the need to make that beautiful chocolate chip recipe pin that everybody makes, make it. And then force yourself to make something different and then test it. See what happens. I love that, I love that. Okay, so we’re talking about let’s say, okay, your first piece of advice is shake it up, make a whole host of pins, make some that look very different. Some of it looks somewhat different and see what happens. And then what do you tell people? Well, you know, here’s one thing that I don’t always say the most popular things when it comes to Pinterest strategy just because, you know, I’m going to speak from experience and what’s worked for me and what’s worked for brands that I’ve, you know, worked with. The number one mistake I think people really get hung up on is this idea of worrying about pinning other people’s content. I know that’s not really popular to say. Sure, as a Pinterest user or a blogger, you want to support, you know, content from your colleagues or your just regular person who wants to pin stuff that’s not your own, like your own recipes and decor ideas. I am not saying you can’t. But people really get hung up on this ratio idea of, you know, they have to pin only a percentage of their own stuff to other people’s stuff. That does not matter at all. So I like to ask people like what sends you traffic when you pin someone else’s content or when you pin your own content. So this idea of like, if you have, you know, limited time to work on Pinterest, why would you be spending it worrying about pinning 80 percent of someone else’s content? There’s not a downside. There’s an upside for you, honestly. So I say the biggest mistake people make is they just don’t pin their own content enough. Pinning, re-pinning, pinning different versions of your post, pending old posts, pinning new posts, that is where the effort should lie, in my opinion. I have never focused on pinning other people’s content since I joined Pinterest I think in 2010. I pin 95% of my own stuff and I always have. So again, I think another low barrier way, very easy lever for someone who has limited time and resources, create stunning pins like we just talked about, test new things, and then pin them like crazy, pin your own stuff. Yes, there used to be that limit. And again, I’m sure, you know, for most people, they would never even reach it where Pinterest said you can only pin 200,000 pins in the lifetime of your account. Now, for us at Catch My Party, we were concerned about that. Not super concerned but we’re like, “Okay, if we pin at this rate, you know, we’ll hit that in like, I don’t know, two years or three years.” But then Pinterest took it away and said you can pin unlimited numbers of pins. So you never have to worry about over pinning. Then I had heard the same thing, though, from Pinterest, which is, yeah, we don’t really care if you’re pinning other people’s content, as long as you continue to pin on the platform. Yeah, I mean, all they want is for fresh new content to be added regularly from you. They don’t care if it’s your own or your best friend. It doesn’t matter. And by fresh new content, that just means images packaged in a different way, images pinned directly from your blog or website. It doesn’t mean you have to go do a whole new photo shoot. Or even needs to be a newer blog post, it’s just to be newly added to Pinterest. So I think one of the biggest mistakes people really get hung up on is they spend all of this time and energy worrying about they’ve got a pin from a variety of sources and pin, you know, 80% other people’s content, 20% theirs, and I would just say let that one go, folks. Just pin your own, you know, take care of your own house, pin your own content. Get it packaged great and get it on Pinterest because that’s how you’re going to get traffic. Right. And I think people feel like, “well, I need to flesh out my boards.” And I would say people aren’t really going to your boards. People do not go to boards. I mean, I think the only people who really go to boards are bloggers because they’re stalking each other. Like, what is she pinning about. A regular Pinterest user who is in fact who we’re trying to capture, you know, a busy mom looking for a quick Christmas cookie recipe, they’re not going, they’re not seeking this out by name and going to our boards. They’re discovering us in their feeds. Yes, yes. They’re typing, you know, they’re typing Christmas cookie. They’re looking at that, you know, then they’re scrolling through their feed and either we’re capturing their attention overnight. Right. I will say that your board descriptions matter to Pinterest because again, it’s data for them in terms of search. So you want to be mindful about filling out your board descriptions with keywords. You want to make sure that the pins in those boards relate to the board because again, you want to be sending these clear signals to Pinterest. But I agree with you completely about like, who’s going to boards? Yes, I mean, if you’re doing nothing else, make great pins. Pin fiercely your own content. And there are a lot of other things like you’re mentioning, you know, keywords and descriptions and board titles. But those two things are just very easy levers to pull in order to see some some increase in traffic. “I wanted to take a short break to talk about MiloTree. I have evidence that MiloTree works. Our Catch My Party Pinterest account just crossed over to 1 million followers. And the way we did it was by using MiloTree. I don’t know if you know this but we built MiloTree predominantly for that very reason. We built it for Catch My Party to grow our Pinterest followers. And it worked. That’s why we decided to roll it out as a separate company to help people like you. So now I’ve got my pin, I’ve got a variety of pins that I’m testing. I am pinning my content religiously. And what would you say in terms of descriptions and hashtags and things like that? Now, again, even you, my hunch is that it’s not like you get like the manual on how the Pinterest algorithm works. Or do you? So I do get, you know, early insights to a lot of things. Okay, yeah, as do others who work in some capacity with Pinterest. But I am highly allergic to changing strategies to very new things that seem like their tests. So, you know, I’m not worried about hashtags, I think they’ll go away soon. Do you? Say that again. I think they’ll go away. I really just like to focus on the core things that make sense, like, it makes sense that people are using Pinterest like a Google search, right? People are going to Pinterest to search. So if that’s true, which we know it’s true, then it makes sense that the copy and your descriptions and your board titles need your focus, that you should be thinking them more like a search. Right? A certain SEO. So those things all make clear sense to me. Outlier things like communities or hashtags, fundamentally, I don’t see how it’s going to radically change anything. So I’m going to maybe test and play and pay attention, but I’m not going to totally, you know, be flustered or shift strategy or now only use hashtags or anything like that. So I would say, you know, it’s important to keep your pulse on new things that are getting rolled out, but not important to like, go crazy. Like, here’s an example. I ask my Pinterest contact what their thoughts were on communities and they’re like, “On what? I don’t know. I am going to ask my team. We haven’t heard anything about it.” Like because sometimes they’re just tests going on in the background. But even Pinterest themselves haven’t been briefed on. So, they might not stick. Yup. Well, I have to say things like communities make me stressed and feel inadequate because I don’t know how to use it, it’s another thing on my plate. I’m not exactly sure. My goal is traffic for Catch My Party. I have no idea how a community is going to send traffic to my site. So I like that you’re saying this because you’re making me feel less inadequate. I think it’s a test. It’s a test to see, you know, can we turn part of Pinterest into a social platform. From a community standpoint, yes. The only way Pinterest is social is, I guess, if you’re collaborating with like your sister on her wedding on a group board. But other than that, it’s not stirring conversation. You’re using it to solve your own problems or be inspired. You’re using it like a Google search. And you’re saving some things for later. Like, you know, you would old days rip something out and put it on the fridge. And, you know, other than that, I’m not sure communities are going to stick. Maybe they will and I’ll be surprised. But, you know, I wouldn’t advise anyone to just feel inadequate or get stressed out about it. What about video on Pinterest? It’s interesting. So I would say that’s the biggest trend I’m seeing right now on Pinterest is this effort to from bloggers and brands to sort of tap into the video space. So video used to be only available to some top advertisers, then it rolled out to all advertisers. And now, I don’t know if it’s still only available to some, but I know my account I can now, you know, upload videos organically. So what I’m seeing in the trend is starting in the brand side where they’re asking for Pinterest videos. So I think it’ll be interesting to pay attention to see do they stick or it almost is starting to feel like they’re just instantly becoming commercials because so many brands are testing the video and they’re designing them like their commercial. So I think it would be interesting for bloggers to sort of, you know, if you’re a blogger who’s already creating video content, the ratio square, it works on Pinterest. That’s what they’re recommending anyway. So why not if you have the ability to test it out and you already have the video because I think if video is going to stick, it’s going to be from content creators and bloggers because we’re creating video that is more in line with what someone, a typical user is looking for. They don’t feel like commercials. So I don’t think the branded videos are going to see as much success because I think they’re creating them like commercials. I just don’t think that’s going to resonate with most people. But maybe there’s room here for a recipe video or a DIY video and maybe that’ll catch on. Right, right. I think that’s good advice. So if you can do it and it’s easy, test it. I think that’s great. I think that’s great. Okay, what would you say then? So with the hashtags, you say, “well, we’ll see.” But what would you say in terms of optimizing your description on your pin? Yeah, there’s definitely some science behind it. I would say you want to think like a pinner, that is just the number one lens you should have. So if you’re going to go on to Pinterest and you’re going to search for something, how are you going to search for it? And so I would say, number one, do that. Do that to test. The really great thing about Pinterest is if you search in, say, chocolate chip cookie recipe, they’re going to have the suggested words underneath that are like filters based on how people are searching for that. So yes, it’s a free tool. I mean, just go on and look it up and see how in fact are people searching for this type of content. And then, you know, come up with a popular phrase that really relates to what your pin is and then use that in your description. I would say, put it in the beginning of your description. So that’s sort of the Pinterest bots, if you will say. Read it first. And make it conversational and it’s not full of keywords. I don’t think most people are reading the descriptions. So, you know, you’re writing them really for the Pinterest algorithm, so that you return in search results. But if someone should read your description, it should be conversational. It’s really not that hard to turn a keyword phrase into a sentence, right? That and do it for every pin. And back to the idea of creating multiple versions of your pin for the same content, switch up your description a little bit so that it also seems fresh and new. You know, it doesn’t take a lot of time to come up with one Pinterest description and then rewrite it three ways. So I would definitely suggest that is effort, you know, well spent in coming up with descriptions that really will capture what people are searching for in a conversational way. And do you think you should always have a call-to-action in your description? I don’t think it can hurt. I always put one at the end of mine. You know, see recipe, get download, browse, GIFs. I mean, there’s just so many. It can’t hurt. Yup, I would agree with that which is, I would say definitely because, again, people on Pinterest, you’re kind of in that that trance and almost like, I want somebody in a trance where it says like click to see because then they go, “Oh, I just click,” like you’re being told what to do. Rather than, “Oh, so pretty.” But it’s like, “Oh, I could click on it.” You know, even though you know this, but it’s like, why not tell the person here’s what to do next. Yes, and that is definitely where my marketer hat comes on because we would never create anything that didn’t have a clear next what we want you to do, the next pass. You just have to tell the people what to do. Yeah. And tell them nicely. But, you know, like, send them on the journey. And especially if the journey is one where somebody gets value, you’re leaving them high and dry if you don’t tell them. Like, it’s good to tell them you have a food blog, you’re really proud of it. You know, make sure they know to click through. And do you recommend short descriptions, longer descriptions? Do you have any thoughts on that? I say a sentence or two. Yup, a sentence or two. You can’t do everything in the description nor should you because your pin is really about one thing, you know, even if it’s leading to a blog post about five holiday pie recipes or five DIYs to make for your mom. Like, it still is about one thing. And so, you know, your search phrase might be like DIY gifts for mom. You don’t need to make a whole paragraph out of that, right? Right. So don’t think about it like you might think about Instagram which can be like a mini blogging platform. Oh, yeah. No, you know, what is this content about? What do you want them to do with it? Do you want them to click, get the instructions or whatever. One to two sentences is all you need. I like that. And what I really like about what you said too is to be mindful about what your goal is like to get traffic and to really do the things that, you know, will do that, like keywords and not get distracted by all this other stuff. Like Instagram keeps rolling out new stuff and then, you know, again, there’s that feeling of like FOMO of like, “Oh, my God, I got to be doing this now and this.” And it’s like Pinterest works because it works. Because it’s for people to be inspired or to, you know, solve a problem. The end. So it’s not the same. Whereas you can get a whole host different things from Instagram. It’s like, nope, Pinterest, this is what people want, this is why they go to the platform. Right. One hundred percent. And if you can solve someone’s problem or inspire them, then your job is done. That’s all you have to do. Someone is searching for something, they want a gift idea for their husband, if you can inspire them with your content, your two lines of description in your pin, and get them to click through, you’ve just made their day. If someone’s searching “how to get wine out of my T-shirt” on Pinterest and you can solve their problem because you have an article about that and this pin that represents it, your job is done. Like, it’s really a problem solve. People are either going there because they’re looking for something specific. They have something they’re searching for or they want to be inspired and they have sort of an idea like kitchen remodel or gift ideas. So if you are creating content, and we’re all creating content that either can solve a problem or inspire someone, so package it up, get it in front of the people and your job is done. That’s great. Okay, do you have any specific insights working with these big brands of what they’re doing, or what is trending, or what they’re asking for. Like, are you seeing anything on the horizon? I guess I would say the video is the biggest thing on the horizon, where I’m seeing a lot of brands paying attention to. They’re definitely paying attention to video. Other than that, you know, I work with so many different brands. You know, designed recently for Ralph Lauren to Pandora. So, I think the biggest thing, especially this time of year is they’re just trying to capture sales and traffic during the holiday season. One thing that, you know, this really isn’t a trend, but one thing that I don’t think we talk about enough is the opportunity bloggers have that brands don’t. So brands have sort of the hand-up this time of year. Bloggers, we don’t really have that luxury. But that’s okay because we know that most people began searching two months before the season or event or what holiday is happening. And the brands start typically playing in the space back then. They wait to the last minute, throw a bunch of money. So I think a really good opportunity for bloggers to keep in mind is just to be ahead. You might not want to be pinning St. Patrick’s Day in Easter right now, but you should be. The average user is going to start searching for that. And if your content is plentiful, and seeded, and you’re regularly pinning this content every week, you’re going back and pinning new Easter ideas or things for the spring time, your content is going to be they’re capturing attention when people are actually searching for it versus when the brand’s waiting to the last minute and put a bunch of money to push ads out into feeds. So I think, you know, it’s not really a trend at all but I’d like to see it being a trend where bloggers are just way more ahead of the game because they understand that they have a bigger opportunity. And hopefully brands can maybe, you know, from the brand point of view, probably could spend a lot less and capture more attention if they acted more like bloggers and kind of did things earlier in that editorial cycle, seasonal cycle than waiting to the last minute. So there are these incentives that you can, as a blogger, work to your advantage, which is you go “Oh, when they zig, I zag.” So they’re putting a lot of money now. They’re wanting to use up their budgets, so they’re going to spend like crazy. So this is if, for example, you advertise, this is not your time to advertise. But come beginning of Q1, at the beginning when they are like, “Okay, we’ve blown through all this money for Christmas,” that’s your time to advertise because chances are, CPMs or cost per clicks are lower. So know when, okay, if you’re going to think about advertising now, I wouldn’t do it. No, I completely agree. Just to back up so no one feels like “Oh, man, I’m not going to be creating content right now for Easter. It’s Christmas, my Christmas tree is up,” it doesn’t mean you have to be creating the content, you just have to be pinning your old content that you already have. I’m sure we all already have something that’s, you know, relevant for the spring time or, you know, January organizing or, you know, home refresh or goal setting. And all we have to do is be pinning it now so that we’re not stressing out on December 15 still pinning our cookie recipes when you have, you know, flower companies paying tens of thousands of dollars to capture that audience because they’re waiting to the last minute. I think that is great. Now, have you explored at all smart loops or anything like that from Tailwind? No, I don’t. In all of my roles as a blogger and working for Grommet, working for 2Modern, I’m a native girl. I don’t use specific tools. And not to say that they can’t be helpful. Part of my job is Pinterest. So, you know, it’s not like I’d forget to pin for 10 days. In that case, you know, using a scheduling tool would be helpful, definitely. Because you need to be showing up and pinning consistently. I don’t have a problem doing that and so I’ve never utilized a tool. And yeah, but I would say you can have success without smart loops and tools. My whole thing is pin for 10 minutes a day. And that served us very well at The Grommet. We ended up getting a case study by Pinterest on their business website and it was a huge channel for our company’s success there. And we didn’t need any fancy tools. So I say that, you know, not that all tools are fancy but to say like if you’re into it, you can buy paying another subscription or doing something differently. You can have success just logging into Pinterest every day for 10 minutes. Yes. Now, how do you think about this? Because you’ve got your blog and you’ve got your marketing career, how do you split your time? Like, how do you think about your blog? Are they both work? Or is one kind of a nice counter to the other? I would definitely say that one, they complement. So I’ve been asked over the years like, why aren’t you just a full-time blogger? And my first answer is because I’d probably hate it, you know, just knowing my personality I started it as a hobby, but also I love my career as a marketer and I’m always learning and being challenged and being introduced to things that I probably wouldn’t be if I was just a blogger team of one. So I love working with the team and really kind of wearing that marketing hat. My time, you know, definitely “9 to 5” like I am a marketer and it’s my full-time job, it has been for 10 years. And so when it comes to Thoughtfully Simple and, you know, it definitely ebbs and flows based on my energy level. The seasonality and, you know, some time like Christmas time there’s a lot more content to be created at the end of the year just because there’s a lot of sponsored post opportunities. I like to host a lot of parties in the summertime and since that’s mainly what my blog is about, I’ll be putting more effort around it then. I would say when I’m not creating fresh content for my own blog, I’m spending about five hours a week and that’s pinning, maintaining, SEO stuff, sending out newsletters, kind of resurfacing old content and participating sort of in that blogging space and with my community on social. Then I would say I spend probably about six hours a week in my role as a contractor for Pinterest and then the rest of the time I also teach a Pinterest masterclass So, I spend several hours a week updating that content and working with students who are taking the course. So pretty much do the blog, Pinterest work, and the Pinterest course in the evenings and weekends and it ebbs and flows. Wow. Okay. And what is the course so people who want to sign up can get there and how would they find it? You can go to ToriTate.com. And that’s T-O-R-I-T-A-I-T. And they’re actually… I have been over the past couple years just sharing insider tips and strategies that I use both as a marketer and as a blogger. I just really think that we can learn from each other and when, you know, when we share, magical things happen. So, you know, I don’t really hold anything back there. And on that site, you can also see the link to my Pinterest masterclass. So, I put together 12 lessons. It’s about five hours of video courses with all the bells and whistles, extra cheat sheets and all of that. That is for the intermediate to advanced Pinterest users. So someone either who thinks they have a pretty good handling but wants to take the next step and are like, “What else can I get out of Pinterest?” or maybe feels are at a plateau, I just sort of share all the insider tips and tricks there and work with students. We have a private Facebook group and all of that, but just my way to, like, Pinterest is my favorite topic. I just had to get it all out. I just had to get it all out and share it. I love that. Okay. And if they want to see kind of your personal stuff and your beautiful drinks, I mean, you also do beautiful recipes and hors d’oeuvres and things like that. But I just always think of you like if I need some sort of cocktail, I look at your stuff. Yeah. And also on that site you have MiloTree, right? Yes. So my blog about cocktails and entertaining is called Thoughtfully Simple. Okay, great. And if people were to want to reach out to you, what is the best way? I would say the quickest way would be Instagram. I’m @hostesstori and I’m not ashamed to say it’s the channel I’m most frequently on, it goes obviously with me everywhere. It’s in my pocket. And just leave me a comment or slide into the DMs and I’m always happy to chat. I love that. And I feel like we need to do a part two where we talk about your Instagram strategies. Yeah. Social media is so fun. It’s always changing, right? Absolutely. Well, Tori, I have to say thank you so much for being on the show and sharing all that you know with all the many hats that you wear. Like, I just love that you get this really broad perspective. You’re very welcome. Thanks for the invitation. I love, you know, sharing and learning from others as well. And so anytime, anytime. If you like The Blogger Genius Podcast, please support us! “If you’re liking the show, there are multiple ways to support us. One, tell your friends, tell your friends who you think would like it about it. Also, make sure you’ve subscribed on iTunes, Stitcher, Google Play, anywhere you get your podcasts. And if you’d like to review us, please leave reviews on those platforms or reach out to me. I’m always open to suggestions for guests for what you’d like to hear how I can be of service to you.